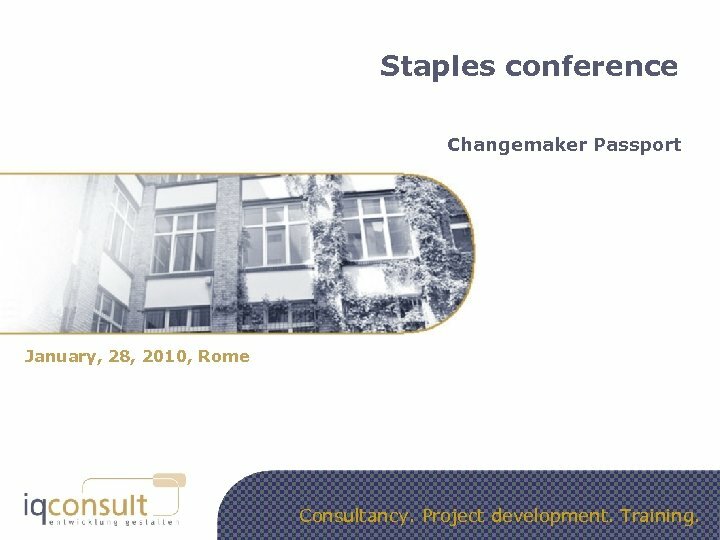 Staples conference Changemaker Passport January, 28, 2010, Rome Consultancy. Project development. Training. Content 1. About iq consult 2. Reports & certificates 3. Our experiences 4. 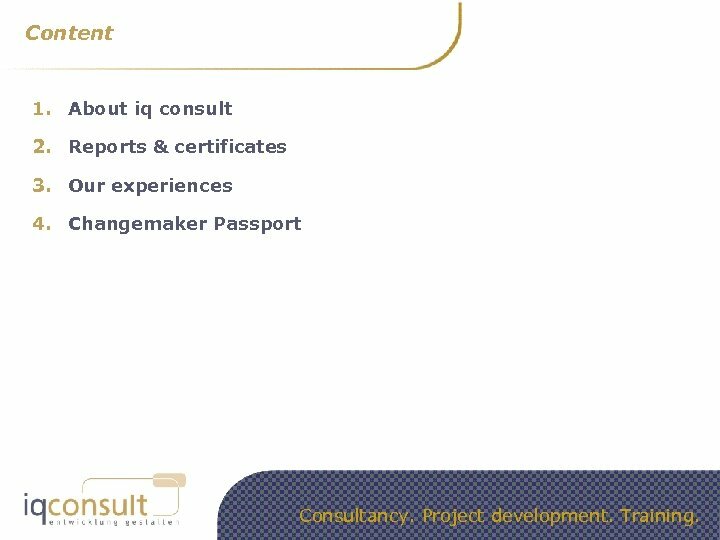 Changemaker Passport Consultancy. Project development. Training. 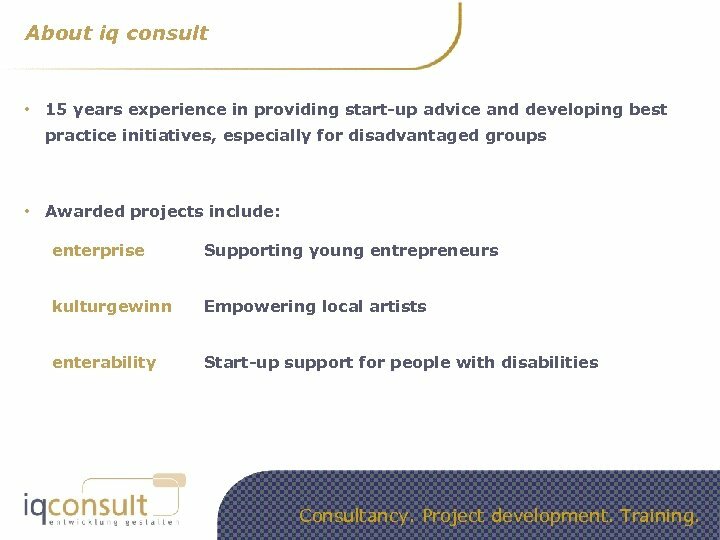 About iq consult • 15 years experience in providing start-up advice and developing best practice initiatives, especially for disadvantaged groups • Awarded projects include: enterprise Supporting young entrepreneurs kulturgewinn Empowering local artists enterability Start-up support for people with disabilities Consultancy. Project development. Training. 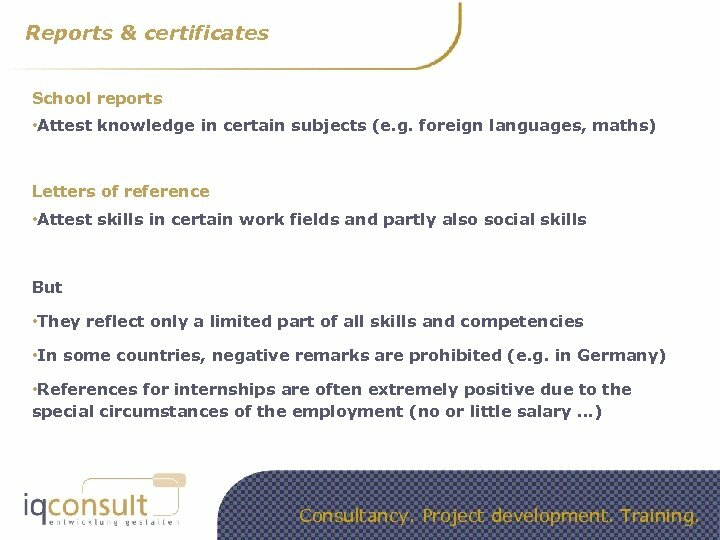 Reports & certificates School reports • Attest knowledge in certain subjects (e. g. foreign languages, maths) Letters of reference • Attest skills in certain work fields and partly also social skills But • They reflect only a limited part of all skills and competencies • In some countries, negative remarks are prohibited (e. g. in Germany) • References for internships are often extremely positive due to the special circumstances of the employment (no or little salary. . . ) Consultancy. Project development. Training. Reports & certificates Ø In order to perform sucessfully in the global economy, companies and employees need to develop further competencies than only expertise on a certain subject. 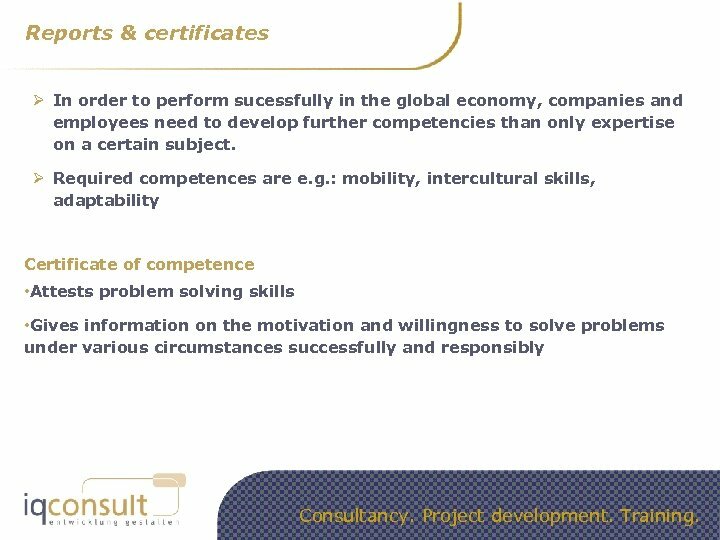 Ø Required competences are e. g. : mobility, intercultural skills, adaptability Certificate of competence • Attests problem solving skills • Gives information on the motivation and willingness to solve problems under various circumstances successfully and responsibly Consultancy. Project development. Training. 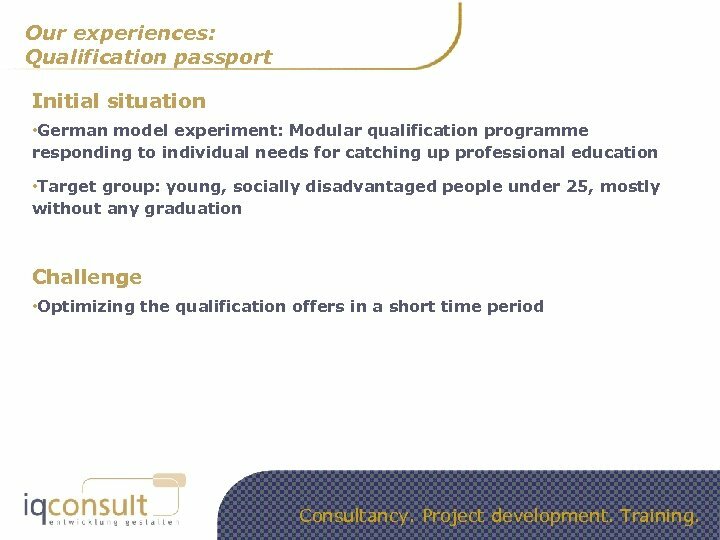 Our experiences: Qualification passport Initial situation • German model experiment: Modular qualification programme responding to individual needs for catching up professional education • Target group: young, socially disadvantaged people under 25, mostly without any graduation Challenge • Optimizing the qualification offers in a short time period Consultancy. Project development. Training. Our experiences: Qualification passport Outcome • Compilation and approval of achieved competences (formal and informal professional and educational experiences) • Check-up via personal interviews and examination • Developing an individual qualification schedule, regarding professional subjects and methods as base for a target agreement • Qualification passport aiming to Ø document experiences and educational processes for employers Ø Motivate, guide and inform the participants Ø Work as controlling instrument for teachers Disadvantage • Only professional skills are documented Consultancy. Project development. Training. 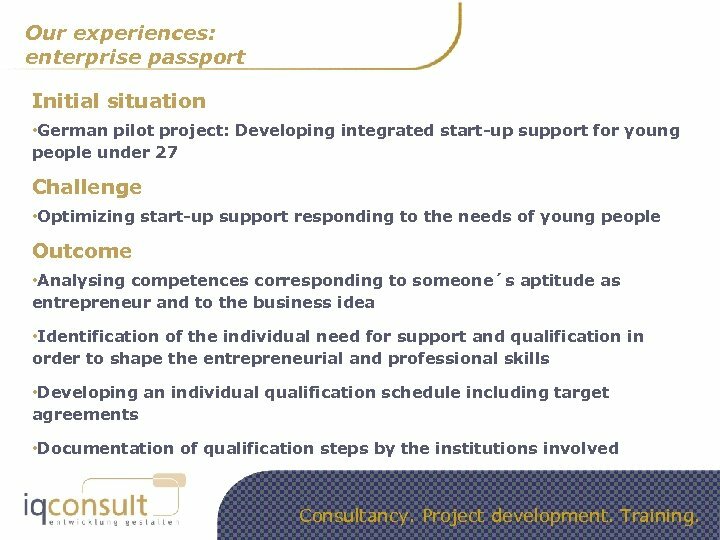 Our experiences: enterprise passport Initial situation • German pilot project: Developing integrated start-up support for young people under 27 Challenge • Optimizing start-up support responding to the needs of young people Outcome • Analysing competences corresponding to someone´s aptitude as entrepreneur and to the business idea • Identification of the individual need for support and qualification in order to shape the entrepreneurial and professional skills • Developing an individual qualification schedule including target agreements • Documentation of qualification steps by the institutions involved Consultancy. Project development. Training. 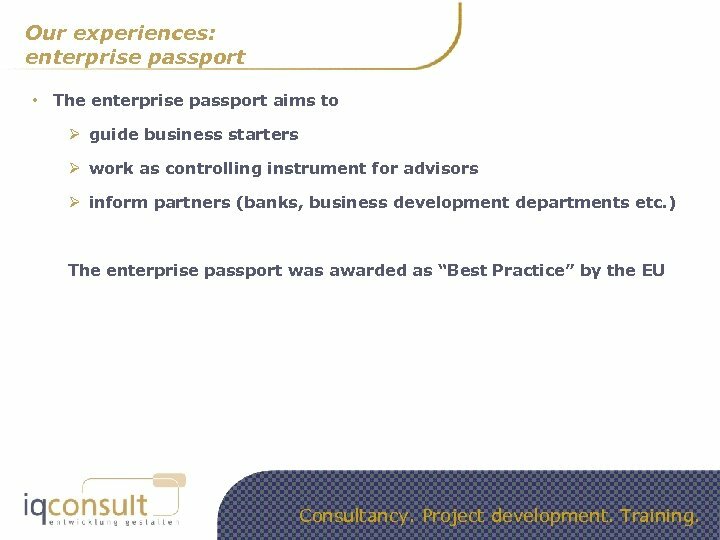 Our experiences: enterprise passport • The enterprise passport aims to Ø guide business starters Ø work as controlling instrument for advisors Ø inform partners (banks, business development departments etc. ) The enterprise passport was awarded as “Best Practice” by the EU Consultancy. Project development. Training. Changemaker Passport Initial situation • Facing global challenges, more and more young people seek to work in a responsible position in the social sector • Social companies require (especially leading) staff with sophisticated social and communicative skills, problem solving skills, empathy and the ability to integrate • School reports and letters of references provide little information on social and personal competencies Challenge • Defining competencies that are crucial for working in the social sector • Identifying fields of work and qualification in which those competencies can be achieved Consultancy. Project development. Training. 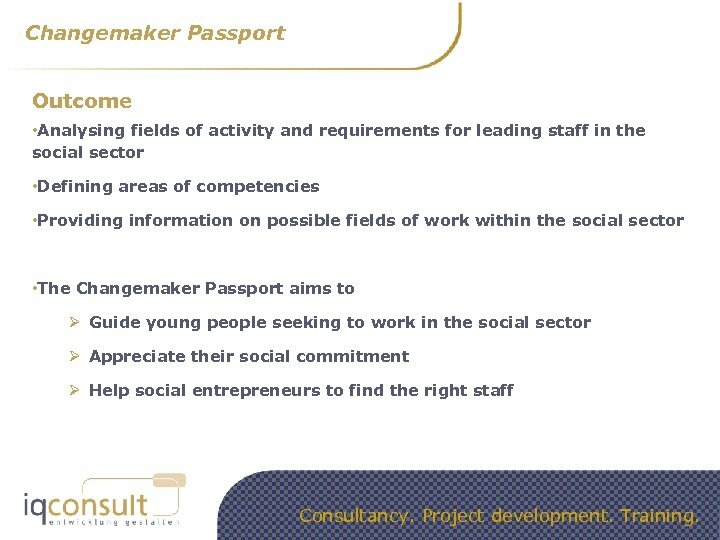 Changemaker Passport Outcome • Analysing fields of activity and requirements for leading staff in the social sector • Defining areas of competencies • Providing information on possible fields of work within the social sector • The Changemaker Passport aims to Ø Guide young people seeking to work in the social sector Ø Appreciate their social commitment Ø Help social entrepreneurs to find the right staff Consultancy. Project development. Training. Thank you very much for your attention! Norbert Kunz iq consult gmbh Muskauer Straße 24 10997 Berlin [email protected] com www. iq-consult. com Consultancy. Project development. Training.